Art 5 of the IR Promotion Act: The national government shall implement necessary legislative measures within one (1) year from the enforcement of the IR Promotion Act. ・By utilizing the revenues of sound casino business operated under the appropriate supervision and management of the government to promote the creation of specified integrated tourism areas that make full use of regional ingenuity and the vitality of the private sector, in order to realize a highly attractive extended-stay tourism with high international competitiveness, this Act sets out necessary matters, and thereby aims to contribute to the promotion of tourism and regional economy, and aims to contribute to the improvement of fiscal. (iii) tourism attraction enhancement facilities by performances utilizing Japan’s tradition, culture, art etc. shall be established and operated as a unit by private enterprises. (iv) oversight of IR business operator by the Minister of Land, Infrastructure, Transport and Tourism. ・At the time of application for certification, if the applicant is a prefecture (e.g. Osaka Prefecture, Kanagawa Prefecture, Hokkaido, Nagasaki Prefecture), it shall obtain the approval of its parliament, and shall also obtain the consent of the municipality of the location. The prefecture may also require the approval of the parliament of the municipality of the location by its ordinance. 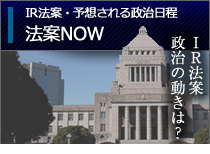 ・If the applicant is a government ordinance city (e.g. Osaka City), it shall obtain approval of its parliament, and shall also obtain the consent of the prefecture in which it exists. ・The effective period of the area development plan certified by the Minister of Land, Infrastructure and Transport is 10 years. Certified prefectures etc. may receive the renewal of certification of area improvement plan from the Minister of Land, Infrastructure and Transport in cooperation with IR business operator. The effective period of the area development plan after the renewal is 5 years. ・The upper limit on the number of certified area development plans (i.e. the number of IR areas) will be “3 (three)”. ・In utilizing casino revenue, IR business operators shall make efforts to improve the business contents of IR business and shall cooperate with measures implemented by certified prefectures etc. based on the annual evaluation results made by the Minister of Land, Infrastructure and Transport. ・When an IR business operator (casino operator) receives a license from the Casino Management Committee (validity period 3 years / renewable), it may engage in casino business. In this case, with regard to casino acts conducted at a casino facility pertaining to licenses and in accordance with the types and methods pertaining to licenses, Article 185 of the Penal Code (“gambling crime”) and Article 186 (“adjunctive gaming crime” and “gambling filed open crime”) shall not be applied to either the casino operator or its customers. ・Other casino business related persons (including major shareholders (having 5% or more voting rights or economic interests of the casino operator), casino facility operators, facility landowners, casino related equipment makers) are also subject to licensing, permission and approval system. ・In addition to limiting casino facilities to 1 (one), the target area of the area regulation and the upper limit of the casino acts area will be regulated by Cabinet Order. In the ruling parties agreement it was supposed to be no more than 3% of the total floor area of the IR facilities. ・Casino operators are obliged to prepare statement of operation procedure, casino facility usage conditions, dependency prevention rules (including admission restrictions by principals / family declarations) and criminal proceeds transfer prevention rues. The Casino Management Committee will examine these documents at the time of license application (authorization of the Committee for the changes of these documents). ・The number of admission of Japanese and foreigners residing in Japan is restricted to 3 times in 7 consecutive days and 10 times in 28 consecutive days. ・As a measure for verifying the identity and the number of entrance of Japanese and foreigners residing in Japan by casino operators, these entrants shall present my number cards and the casino operator shall verify the identity and the number of entrance these entrants by using the public personal certification on the card. The Casino Management Committee will centrally manage information on the number of entries. ・For those under the age of 20, organized crime groups, etc. (boryokudan, etc. ), those who unpaid admission fee, those who have exceeded the number of entrance times are prohibited from entering casino facilities. Casino operators are also obliged not to enter these persons. ・In addition, regulations such as the type and method of casino acts, casino related equipment, specified ordering business (such as loans), outsourcing/contracting, advertisement/solicitation, order maintenance measures in casino facilities, and employees are stipulated in the Act. ・For Japanese visitors and foreign visitors residing in Japan, national government and certified prefecture, etc. will charge 3000 yen per time (24 hour unit) as admission fees respectively (6000 yen per time in total). ・Government and certified prefectures, etc. shall pay the amount corresponding to the amount of the levies to the policies concerning promotion of tourism, measures concerning the promotion of regional economies, measures to achieve other objectives of the law and promotion of social welfare and promotion of culture and artistic creation. ・The Casino Management Committee is set up as an external agency of the Cabinet Office. The chairman and the four members of the Committee shall be appointed by the Prime Minister with the consent of both houses. ・The Casino Management Committee has the authority to supervise the casino operators, to collect collections reports from the casino operator, to conduct on-site inspections, to make inquiries to public offices, to consign its inspection authority and to oversee disposition. ・The Act will be enforced from the day specified by the Cabinet Order in order not exceeding 3 years from the day of promulgation. ・After five years from the date of approval of the first area development plan, the government will review the status of enforcement of this Act and will take necessary measures if necessary. However, with regard to the number of certified area improvement plans, the government will review it after seven years from the date of approval of the first area development plan. conducting the application/certification process twice under the upper limit of the numbers of IR area approval (i.e. three (3)), considering the preparatory situation in local governments and from the view point of manifesting the effect of IR and ensuring procedures such as local consensus building. Although this consideration is not stipulated in the Bill, it will be considered to be stipulated in the Cabinet Order.